The first piece of ice you encounter each turn gains code gate until the end of the run. "I was not; I was; I am not; I am all." Basics: with less influence than all shapers save for Professor (who ignores influence as his ability, so....) you are taking Kit for her ability and only her ability. No matter who you look at, of any and all other runners, with a single breaker and a a few credits Kit is still the safest face check in the game. To Kit with 3 cards, 3 credits, and a Gordian Blade A Komainu is as as dangerous as an Errand Boy or a Bastion. All are a 3 break if they are the ICE you are running blindly into. Literally, if your first turn is a Sure Gamble, a Cyber-Cypher, and a The Maker's Eye you can run R&D on the first turn and know you will get in, unless the corp has ICE stacked two deep or more than 10 credits or they have Wraparound in the opening hand. And for most ice, it costs as many credits to break as the ice has subroutines. Go to Sneakdoor Zeta for an example and you'll see using Rainbow and Chimera as examples that Decoders are often cheaper overall than Sentries as breaking. Late game, this can simply be a way to make sure you have cheap breaks. And a dozen more ways to say, you can get by cheaper safer runs with Kit than with any other runner. So why isn't she more dominant? 10 influence is a killer for sure. Want to run Spooned to be able to destroy that major piece of ice? Well it's close to 1/3 of your influence right there. You have to make hard choices. Code gates often want to sit on the outside anyway? Chum... Inazuma... even Builder and RSVP... You don't want all code gates out front, but many of them work well at the outermost ice in a server. And so your ability is a little moot. The ability only works on the first ice you encounter on the first run you make in a turn. 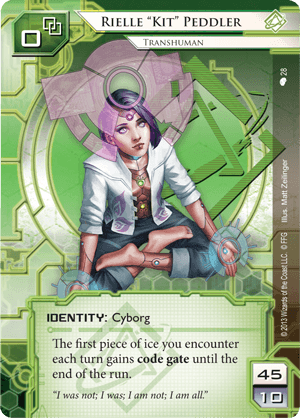 On your second run, you are just a easy a victim as Kate "Mac" McCaffrey: Digital Tinker, only you didn't get the link, the econ ability, or the extra 5 influence. Wraparound still works just as well as it does against AI breakers (although Swordsman is a joke). Make a deck that only intends to run once a turn. Perhaps you can spend all the clicks on Magnum Opus or simply plan to use Lockpick for all your econ knowing you let the Rig do most of your work. Use all your shaper tutor power to simply make sure you always know the tool you need. Maybe they had to run get a Chum to feel safe? Fine, but by then you still knew what was behind the chum and had the time to go get the breaker for that. Spooned sounds like a good idea, except that you almost would rather break the non-code gates since those are the trouble ones one they aren't the first ice in a turn. ZU.13 Key Master is usually a great cheap breaker for aggressive running. But it's the wrong way to go here. If you plan to run more than a few times in the whole game, splurge dude! It's not like you are Exile and need something you can pitch when every you want. Perhaps you skimp on a killer or a fracter, but this is going to be your big boy. Make it something you know you will use and use and use. Boy Inversificator is sure a card now. You don't care until they have 3 ice on a server, and then you play Egret on the 3rd one if you REALLY need to. It works really well, and boy it's not very interesting or fun for the Corp having all their ice just get invalidated and swapped around to the least-expensive potential combination.